Home Yu-Gi-Oh! Yu-Gi-Oh! 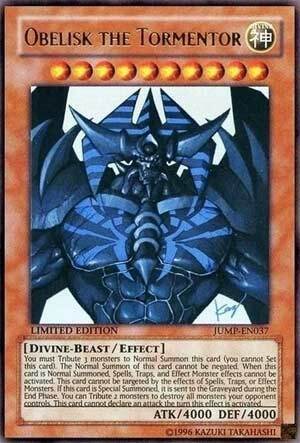 Card of the Day Obelisk the Tormentor – Our 4,000th Yu-Gi-Oh! Card of the Day! Obelisk the Tormentor – Our 4,000th Yu-Gi-Oh! Card of the Day! Requires 3 Tributes to Normal Summon (cannot be Normal Set). This card’s Normal Summon cannot be negated. When Normal Summoned, cards and effects cannot be activated. Cannot be targeted by Spells, Traps, or card effects. During the End Phase, if this card was Special Summoned: Send it to the Graveyard. You can Tribute 2 monsters; destroy all monsters your opponent controls. This card cannot declare an attack the turn this effect is activated. Obelisk the Tormentor is a great choice for our CoTD anniversary. Protection against summon negation is great for a 4000ATK boss monster. Once this guy hits the field (and he will because of that protection) other cards aren’t able to activate, so stuff like Torrential Tribute is locked down as well when Obelisk is Normal Summoned. Protection against targeting effects, another fantastic effect worth of the DIVINE. Raigeki effect for two monsters is a massive plus in your favor, as the monsters don’t have to hit the grave (Macro Cosmos protection) or even be actual monsters. Give up two goat tokens and wipe the board clean. Obelisk can’t attack that turn, but your other monsters can. If you don’t care about all the Normal Summon protection Obelisk gets, you can dump him in the grave and bring him back, then trade him in for a Link Monster before the end of the turn, otherwise you’ll lose out on Obelisk. A fantastic card if you can fit him into a deck. He can’t be searched with anything reliable or flexible, which hurts the card, but it is still a great card to use. The baseline strongest of the god cards, which is why he is the most used of the three. 4000 cards reviewed is a huge milestone that I am glad to be a part of. Obelisk the Tormentor is an excellent choice because of the 4000 ATK/Def stats and because of how long it took to be printed for actual gameplay. Divine and Divine Beast typing aren’t making the gods any easier to place in the competitive field. Level 10 works with their Field Spell, Mound of the Bound Creator, to wreak more havoc on the opponent. All that being said, Obelisk and the other gods as well are just too expensive. 3 Tributes to Normal Summon Obelisk is a lot. While yes you can get the monster field wipe effect without the Normal Summon, Special Summoning Obelisk means it dies during the End Phase. The opponent’s field wipe effect costs 2 more tributes and means Obelisk cannot attack that turn. Being immune to all targeting is excellent protection in addition to the Normal Summon being protected from any response or activation. Obelisk has always been the best of the god cards, but it seems unlikely to come out of the binder. All the artwork is amazing from concept to actualization. It is insane that this site has reviewed 4000 cards over the 16 year span of Yu-Gi-Oh that goes all the way back to LOB. What’s funny is that, counting all the multiple reviews single cards have, this site probably hasn’t reviewed 1/3rd of all the cards on here, we’d probably be in the 5Ds era still if we reviewed cards in order of release for every single one. Today, we look at a card that has seen reviews in the past, but is fitting for the 4000th review, Obelisk the Tormentor. Obelisk is a Level 10 DIVINE Divine-Beast with 4000 ATK and 4000 DEF. No matter what, 4000/4000 is nothing to laugh at. DIVINE and Divine-Beast are really exclusive to the Egyptian Gods, though Horakhty has a type of Creator God with its DIVINE attribute and I believe the manga’s Wicked Gods and 5D’s anime’s Nordic Gods have the DIVINE/Divine-Beast combination, but in real life they are exclusive to the Gods and in turn don’t have too many benefits. Obelisk, like the other Egyptian Gods, requires 3 tributes to Normal Summon and cannot be Normal Set. Well, something of the “power” of a god shouldn’t require the normal 2 tributes. The Normal Summon of Obelisk cannot be negated and cards and effects cannot be activated when it is Normal Summoned, cause you really shouldn’t be able to stop a God. Obelisk cannot be targeted by any effect whatsoever, which this is oddly the only God card to have this protection as Slifer and Ra don’t have this, and what is even odder is that this doesn’t even protect Obelisk from everything. I’d expect more protection on a God, but any protection is better than no protection, and targeting protection is always good to have. During the End Phase, if this card was Special Summoned, it is sent to the GY. I guess Gods don’t like the disrespect of not properly summoning them, but I guess this gives Obelisk more balance in the card game. You can tribute 2 monsters to destroy all monsters your opponent controls and this card cannot attack the turn this effect is activated. Not a hard once per turn, but you are likely running out of monsters to tribute or your opponent’s field will be gone after you use this once anyways. You already have to give up 3 monsters to tribute, but I guess Obelisk wants more in order to do more on the field than just have 4000 ATK and not be targeted. 5 monsters to tribute is a lot though, but this effect can be nice to have later on. The lack of an attack the turn you use that effect is rough, but I guess Obelisk is giving in to his power to use this effect as well. Obelisk is easily the best Egyptian God since it has base stats that are amazing while the others are dependent on other factors for their stats, and Obelisk has targeting protection that the others lack. If you want to play a God, Obelisk is likely the one you want to go to, though in modern times, decks don’t need to summon a God to win games. It is my personal favorite God card as well. Art: Well… this is dependent. The original artwork we are all accustomed to is a 5/5 for me cause I like the classic Light Blue Obelisk, and that is the one the anime appearances Obelisk has resembles the most and I always think Obelisk looked the best out of the gods in the anime. The artwork seen here from the JUMP Promo Magazine is probably a 4.5/5 cause it seems Obelisk went to go get a tan and some tattoos, though still looks very menacing. The movie one released recently is a 4/5 cause while it is cool, it will never match up to the first two artworks for me, especially the first. There are some days Grandpapa Alex feels older than others, and on the occasion of our 4000th Card of the Day, I feel much older than usual. But in a good way. I’ve been privileged and lucky enough to be here for all our milestones (1000 being Exodia way back in the day…how I miss ExMinion, Tranorix, Jaelove, Sand Trap, Coin Flip, Otaku) but one of the coolest parts of this job is being able to work with such a diverse group of people. We’ve had dozens of reviewers here over the years, and here we are, at 4000. Obelisk (with his 4000 attack and defense, get the connection?) is probably the most well known…lored…of the Gods from the original anime. Based on he had the most screen time, whether being held by Kaiba or Yugi, and then he got an extra summon in the Doma/Orichalcos arc, as well as an extra turn to play in the Memory Arc when Bakura invades the Phaorh’s chamber. And, as sometimes has happened in the past, this actually isn’t a bad card. Obelisk, in my opinion, is the best of the three God cards. (This art is super sick awesome too, being more Egyptian themed). Three tributes is demanding, but fitting for a God, and you get the bonus of the card not being able to be negated via Normal Summon. Protection from all Targeted Monster/Magic/Trap effects is great, as well as a nuke the opponent’s Monsters by Tributing two of your own (although that gets rid of your Obelisk attack). Are you very likely to see an Obelisk Deck? I doubt it, there are fun Decks involving one or more of the Gods you can see pop up every now and again. Enjoy Obelisk, enjoy the nostalgia, enjoy building a Deck around him. I’m glad I got to be part of this, and I hope to see 4000 more. (Or, maybe more realistically at least get to 5000, the big ones are X000 and X500 to me). Rating: 3/5 Maybe generous, but special for actually being the best and a momentous occasion. I had an idea about this card being #4000 for a long time, like ever since I requested Blue-Eyes Ultimate Dragon to be #3000 (3 heads, 3rd card, HL3 confirmed). But what else could dethroned BEUD except for an Egyptian God card, which also happens to be a Kaiba. Obelisk in tournament play? Not really happening. 3 tributes is just too much. But compared to the other 2 Egyptian Gods… On the upside, having 4000 ATK out the gate is better than Ra and Slifer which could very well have <1000 ATK, depending on your hand and life advantage. But Obelisk’s effect is just really stupid. You need to tribute 3 monsters to Normal Summon it on top of also needing to tribute 2 monsters to the clear the field. A 5-card cost plus Obelisk to summon is ridiculous. Worst of all, you can’t even attack during the turn you use this. Maybe I can understand if this was Special Summoned somehow, but on a Normal Summon, ridiculous. This effect was never going to work in real life. Just enjoy the art and the theme. Bill’s Note: Yeah, that would be funny! I didn’t though.